The Freeman family--Charles, Laurel, and their daughters, teenage Charlotte and nine-year-old Callie--have been invited to the Toneybee Institute to participate in a research experiment. They will live in an apartment on campus with Charlie, a young chimp abandoned by his mother. The Freemans were selected because they know sign language; they are supposed to teach it to Charlie and welcome him as a member of their family. But when Charlotte discovers the truth about the institute’s history of questionable studies, the secrets of the past invade the present in devious ways. 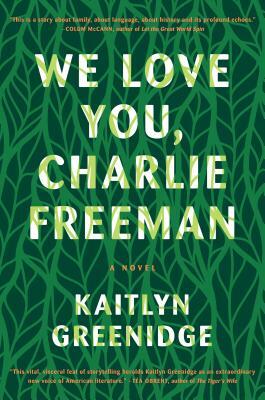 The power of this shattering novel resides in Greenidge’s undeniable storytelling talents. What appears to be a story of mothers and daughters, of sisterhood put to the test, of adolescent love and grown-up misconduct, and of history’s long reach, becomes a provocative and compelling exploration of America’s failure to find a language to talk about race. Kaitlyn Greenidge received her MFA from Hunter College, where she studied with Nathan Englander and Peter Carey, and was Colson Whitehead’s writing assistant as part of the Hertog Research Fellowship. Greenidge was the recipient of the Bernard Cohen Short Story Prize. She was a Bread Loaf scholar, a Lower Manhattan Cultural Council Workspace artist-in-residence, and a Johnson State College visiting emerging writer. Her work has appeared in the Believer, the Feminist Wire, At Length, Fortnight Journal, Green Mountains Review, Afrobeat Journal, the Tottenville Review, and American Short Fiction. Originally from Boston, she now lives in Brooklyn.